Chuck asked on the CJ-3B Bulletin Board for advice: "Time to get the body redone and looks like I'll be the one to do all the grunt work. Just wondering about all the various disconnects/removals and all the body points where it attaches to the frame." Rusty: "First thing to do is remove the steering wheel (see Tech Tips on Steering Wheel Removal) then disconnect the drag link from the steering box. Next, remove the box from the frame and lower it to the floor. Now you can get the body off without lifting it over the column. Take your fenders off. Disconnect all under-hood conections, and decide what you are going to do with the wiring loom. I would unhook it from the lights, etc. and leave it alone under the dash. Now you can bust your knuckles getting the body bolts off; most are easy to find. Lube them up before you start on the steering wheel." 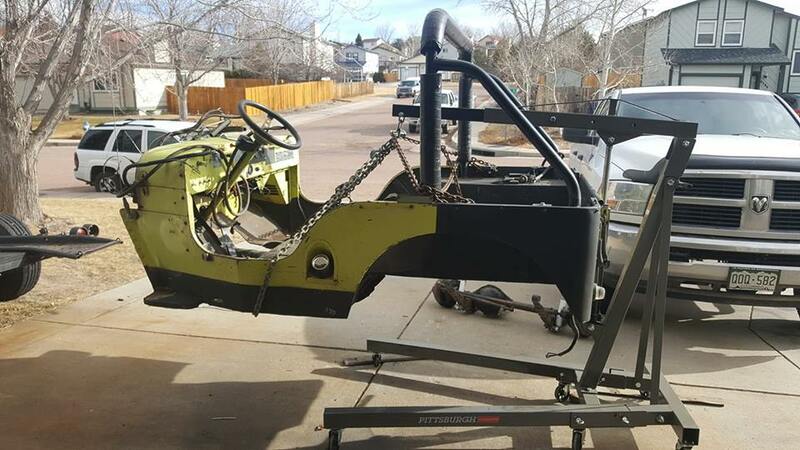 In the photo Dan Bever lifts his 1953 CJ-3B body by the roll cage, using a chain and come-along, with the steering column removed. Jeremy Gerrish: "I also had a question about this. On my '56 B I took all of the bolts off but there were 2 supports welded from the frame to the step just forward of the 'door' opening on either side. Is this normal? I had to cut them with an angle grinder in order to get the body off the frame." Chuck: "They shouldn't be there. Just looked at my '56 and the supports go from the step to just under the frame where they are bolted on. Looks to be fairly straightforward. "But does the steering have to be dropped in order for the body to come free, or is that just easier? Sounds like it can be left in place, as I would prefer since the steering is perfect. Don't want to mess with something that doesn't need it. Mechanically, there's just the issue of the blown head-gasket and maybe some type of 'refreshing the engine' but not looking to do anything major." Lance Macmaster also asked: "Can I remove the tub without first removing the steering column and/or the shift levers? Will it come off with them both in place?" Bob responded: "Yes, that is how most people do it. You'll need to pull the steering wheel and take the little panel off where the steering column comes through the floor. You'll also have to take the shifter knobs, boots and cover plate off. If you tilt the body just right and pull it back as you lift, it will clear everything. It's a good idea to have 3-4 people on it, plus one more to move things around." 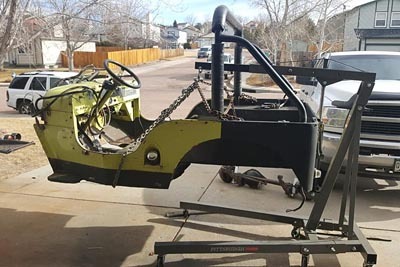 In the photo, Brett Chitwood's 1964 3B frame has had the body removed with the steering gear intact. Jeremy said: "My wife and I pulled the body of our '56 off. She's a saint, a strong saint!" Lance Macmaster: "Two of us removed the tub on Sunday - no problem! I'm going to need a few more people to put the new one back on, though. I think I'll need to remove either the steering column or the shift levers, as the old tub came off sorta hard. Suggestions would be much appreciated." Rusty: "If you don't drop the steering column you have to lift the body high and take it back at the same time and try not to get hung up on the shift levers. If the steering is good it won't hurt it a bit to take it loose and reinstall later. It is easy for two men to lift and remove the body but that steering column can make it a tough chore because of the height you have to lift. It's your call; dont drop it!" Bob Christy: "We took mine off leaving the steering alone. With three guys and enough clear space around you it's not too hard. When we put the body back on, there were four of us just to prevent damage. One important note about putting the body back on is to put the front clip on first and move the body tub into it. That way you know the tub is in the correct place." Jack suggested a different approach. "I use my hydraulic engine hoist on a concrete garage floor, rolling straight back to the rear while lifting up & off. Steering column left in. A one person job and no sweat. Be safe." Jason McBride's photo shows a similar technique with the steering box disconnected. See also Brian Maglosky lifting the tub with a Bobcat (140K JPEG). Dan Arnold agreed: "I'm with Jack, I use a chain fall hooked into a 10 foot ceiling, and its a one man job even with the steering in place. The challenge is getting hooked up short enough if you don't have a 12 foot ceiling. Just blow the tires up real hard and ease the chassis forward with your big toe as you come up with the body. I made a hole in the hump so I could get the transfer case shift lever shaft out. I think some floors already have the hole. I would take the T90 lever off, it's easy, no reason to leave it there. You can then drag the body around by yourself, put it up on sawhorses yourself, flip it over yourself. It's one of the great appeals of Jeepdom -- but I did get some help flipping the frame/springs/axles during sandblasting." Tom: "I just got the tub back from the body shop and they had to replace some of the support bracing (hat-shaped or channel) on the under side of the tub. I think they put it in the wrong place. The channel does not line up with the frame bracket under the tool box and gas tank. It has been about a year since I took the tub off so I could be mistaken, but I think I should have bolts there, right? Currently I am able to use the bolts that are located in the floor, the ones in the bed, and the rear ones above the bumper. Are these enough?" Ernie: "I just put my tub back on a few months back. I counted a total of 14 bolts in the tub. Two up in front on some brackets below the firewall, 4 in the front floor, 2 in the rear floor, 4 across the rear crossmember, also 2 on a flange under the body below the step in the floor. If you're just cruising around town with your Jeep you could get by just fine without those 2 bolts, but rough offroading may over-stress the body mounts on either side of the missing bolts. #6 Outer 2 ea 5/16x18x7/8" bolts & nuts and 2 ea 1/8" liners. # 6 inner (2 ea) and Outer (2 ea) will be on the rear crossmember which is where the drawbar, pintle or bumperettes bolt on." When Alan Haley was getting ready to mount an aftermarket tub on his frame, he was concerned about positioning it, without existing mounting holes on the body to match up with those holes on the frame: "I don't know exactly how far foward the body should go. I think the big issue will be how close the firewall should be to the engine. There are no pre-cut holes on the tub to go by. What do you all think? And does the body bolt directly to the frame or should there be some sort of gasket or washer to buffer the two?" Bruce Noren: "I used hockey pucks as the cushion between the body and frame -- they worked great. Also, I set the grill in place, then fenders and tub. Then I moved each around until everything lined up. Don't bolt it down until you have have lined it all up. Always double check the alignment from side to side and front to back. You don't want to 'dog trot' because you bolted the tub on too far to one side or the other. Measure it, then measure it again, and if still not 100% sure, measure it again! Take your time." This photo is from Frank Porfidio's article on Improving the Repli-Tub. Scott Blystone: "Check the CJ-3B Database for a 3B owner near you. I imagine most of us would be willing to drive a 3B over to look at while lining your body up -- just in return for seeing how your replacement goes on. There are folks in the registry from just about everywhere and to the last one they have always been good folks. An earlier post was also correct - I would start at the grill and work backward. My 3B had a frame-off restore many years ago by previous owner. All body to frame mounting points have a 2" x 3 - 5" chunk of old tire in the middle. Seems to work pretty well. These are all about 3/8 to 1/2-inch thickness with some compression of the remaining tire tread." Brian Greif: "I replaced the tub on my 3B. The mounting brackets along the back of the tub is where I started. I think there were 4 or 6 L-brackets welded to my tub. I lined these up (they were slotted for some adjustment) and placed bolts through them into the corresponding holes in the frame. From there I went to the front of the tub and just measured from the frame to the outside of the tub and clamped in place and drilled the rest of the holes from underneath the frame using the holes in the frame as a guide. 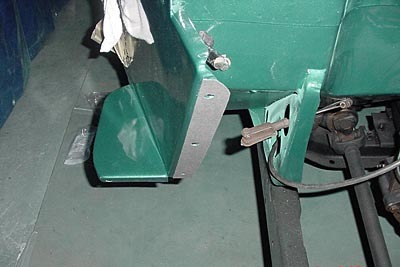 For isolaters I used a hole saw and cut some round pieces from a thick rubber mud flap (off a semi truck)." Jim Sammons: "If you're mounting all the body parts, mount the grille first. You will notice that the front fenders bolt to the frame with two bolts just over the front axle. Then set the body on the frame and push it forward till it meets the fenders. If the body is a correct replica there will be two brackets extending down from the front of the firewall which will bolt to the frame with two 3/8 SAE bolts. The nuts should already be there as they are captive nuts. Then all you need to do is space the rest of the body up off the frame with various thicknesses of rubber between the body and the mounts, keeping an eye on the grille and front fenders so as not to put them in a bind. If all goes well you should end up with a 3/8-inch thick piece of rubber between the body and last cross member. "Remember, you must mount the grille and front fenders first or nothing will line up right. I am in the process of re-mounting my original 3B back to its frame, and made the mistake of putting the tub on first. When I got to the front fenders the holes wouldn't line up with the ones on the frame. I didn't have to take the tub back off but loosened up all the bolts and took the weight off via come-along attached to the roll bar and moved everything forward a bit. So I guess the trick is, don't tighten anything down until everything lines up." 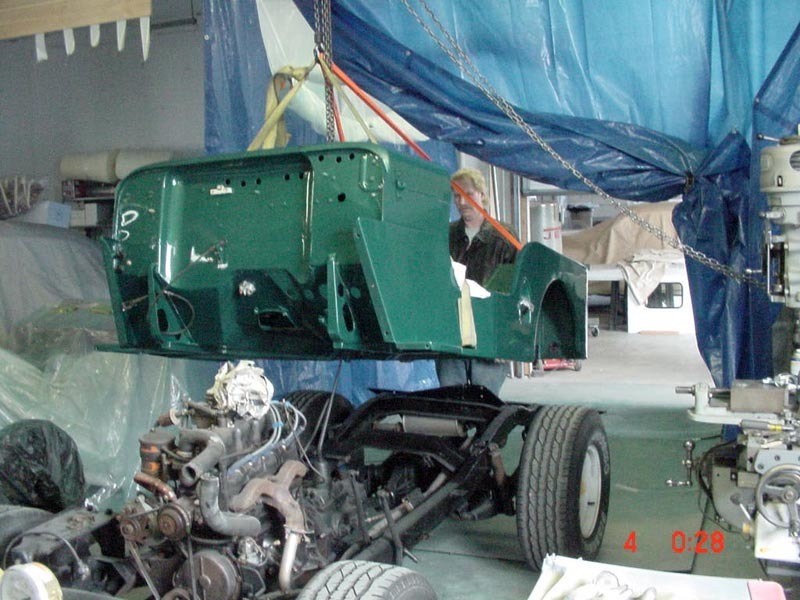 As he was nearing the end of the rebuild on his 1953 CJ-3B, John Greer noticed that his manual showed anti-squeak strips between the fenders and the frame. He asks: "Can I buy these somewhere or should I just make some out of rubber strips? Also, are there any strips between the grill and the fenders?" Bart replied: "The anti-squeak I found on my Jeep between the fender and the cowl appeared to be a loose weave cloth. It looked like a window screen. It was apparently saturated in black creosote or some such waterproof substance. Mine was rather stiff after 50 years and looked like it might break if I bent it. It did its job because I didn't notice any significant rust at the connection. "I could be wrong but I don't believe there is any anti-squeak or welting between the fender and the radiator guard. The danger of cotton welting is that if water is absorbed, it will sit there and rust." Lawrence commented: "You are correct Bart, there is no anti-squeak material between the radiator guard and the frame and the fenders. Unlike the 3B tub, the radiator guard is bolted directly to the frame with no anti-squeak material between the bottom of the radiator guard and the frame." Bart suggested: "I am wondering if one wants to replace the missing anti-squeak if it might make sense to use the 'new' plastic screening. It is rust proof, somewhat flexible, so it shouldn't cut or scrape the paint off and should allow water to drain out of the connection without holding water and rusting." Ernie stated: "I used window welting, the kind used to hold automotive door glass to the lower channel, available at any auto glass shop. It's about 1/16" thick and comes in several different widths. It's waterproof, very pliable and it will seal the water out while keeping the metal parts from rubbing. I also used it under my headlight buckets and parking lights where they mount to the grill." Scott remarked: "Check out Beachwood Canvas, they are not cheap but they will have all the welting strips you need." Bart: "Do a Google search and you'll come up with anti-squeak kits for old Chevys. Certainly these are made of new materials and it may be that any major parts store might have materials which will do the job. "Apparently, these anti-squeak materials are used where movement is most likely to take place. When you hear a squeak, there is metal to metal movement and that means wear, bare metal and rust. "Cotton welting was not used between the fenders and cowl and it is probably a mistake to use it there. According to Matt Joseph (the auto restorer) welting is often the cause of rust as it absorbs water and does not release it."